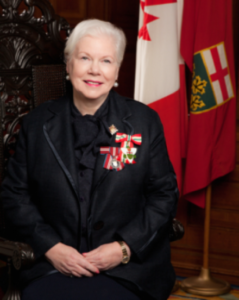 The Honourable Elizabeth Dowdeswell was invested as the Lieutenant Governor of Ontario September 23, 2014. Ms. Dowdeswell holds a Bachelor of Science in Home Economics and a Teaching Certificate from the University of Saskatchewan, as well as a Master’s of Science in Behavioural Sciences from Utah State University. She holds 11 honorary degrees among various other high distinctions including Officer of the order of Canada, Queen Elizabeth II Diamond Jubilee Medal, and Dame of Justice of the Most Venerable Order of the Hospital of St john of Jerusalem. Ms. Dowdeswell’s great career of public service began as a teacher and university lecturer, and her experience spans from provincial to federal and international levels. Ms. Dowdeswell has held numerous senior leadership positions prior to her current role as the Crown’s representative of Ontario including serving as Deputy Minister of Culture and Youth for the Government of Saskatchewan and as head of the Atmospheric Environment Service. She was elected as Executive Director of the United Nations Environment Program and Under-Secretary-General of the United Nations in Nairobi, Kenya, where she resided for six years. Upon her return to Canada, she founded the Nuclear Waste Management Organization, an international consulting practice. Immediately preceding her appointment as Lieutenant Governor, the Honourable Dowdeswell was President and CEO of the Council of Canadian Academies.